Acids / AHA's are really an amazing skincare ingredient! I've been using them for a few years now and my skin has never looked better. However, I do find that my skin is a little sensitive to some. I mean that they break me out and leave my skin looking and feeling angry. I'm not sure if this normal but if my skin is looking Red and feeling sore I don't think that is a good sign. So I wanted to share my favourite acids that are gentle yet effective. Although acids sound super scary, they're really not. There are Two forms of Acids that I'm going to talk about today AHA/BHAs, these are also known as Gylcolic, Lactic and Salicylic acid. Both work in a simialr way to dissolve the bond that holds dead skin cells on the skin. By dissolving these bonds the dead skin is removed and fresh brighter, younger looking skin is revealed. This also helps prevent the pores from becoming blocked and reducing breakouts. AHAs/ BHAs have also been said to help reduce the signs of the ageing. So it really is a wonder product. However, not all skins will get on with acids and there are definitely a few I've tried that had an adverse effect on my skin. But here are the ones that really get the job done, without any irritation or angry breakouts. This one of the first AHAs I ever used and I still use it to this day! This contains 5% Glycolic acid (AHA) which is used in a toner. It's gentle enough it can be used twice a day, but I like to use once a day because I have quite a few AHA products in my routine so I don't want to over do it. It really helps to keep my skin glowing and fresh looking. I think this helped even my skin tone over time to. 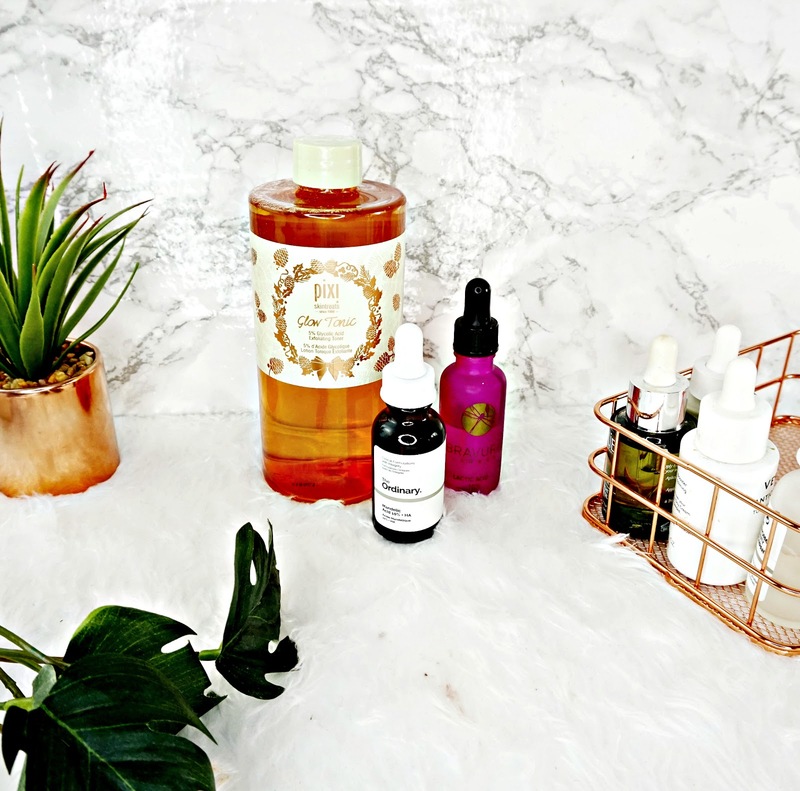 This AHA is the perfect place to start if you're new to acids / have sensitive skin. Mandelic acid is another form of AHA that has the same effect on the bonds holding onto skin cells, but Mandelic is far more gentle than Glycolic / lactic acid. This is because it has a larger molecular weight so it doesn't penetrate the skin as deep. But it still gives amazing results. From one use my skin was so much softer, smoother and more radiant looking. This doesn't irritate my skin at all, it doesn't tingle or anything on application. It has the same effect as most other AHA treatments but it's far more gentle. It has a watery consistency that absorbs really quickly into the skin. I like to use as the first step in my evening skin routine, before any other products. I've been using this for well over a month now and it has really helped keep my skin looking it's best. This was of the first acid I used that actually worked. This offering contains Lactic acid which is still an AHA but it's said to be better for sensitive skin because the body naturally produces it. This one in particular is formulated with Rose Water to help with hydrating on the skin. I like to use this as a mask rather than a leave on treatment. I leave it on for around 10 minutes and the results are brilliant. It does tingle on first application, but it's nothing uncomfortable of concerning, it's more like I can feel the product working. After using this my skin is incredibly soft, I can't stop stroking it! Overall, if your new to acids this one is a great place to start.